The Friedlander Group - "It's good government. It's common sense,"
Home » In the News -all » Quotes, Mentions, Photos » "It's good government. It's common sense,"
"It's good government. It's common sense,"
said political consultant Ezra Friedlander, an Orthodox Jew. "Forcing parents into signing a consent form was counterproductive. It alienated the community." 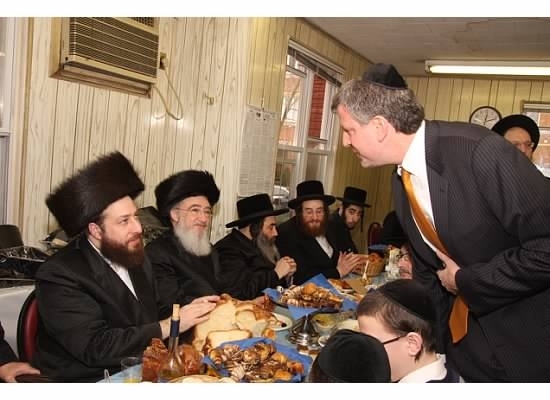 The de Blasio administration is scrapping its consent rule for a controversial Jewish circumcision ritual, City Hall announced Tuesday. In return, a group of ultra-Orthodox rabbis agreed to help city health officials identify and test circumcisers, or mohelim, after a baby boy is diagnosed with genital herpes following the oral suction procedure. The mohel could be banned for life if he tests positive and the DNA strain matches the infants. The agreement overturns a policy that was enacted by the Bloomberg administration to prevent baby infections. "Today's action rebuilds the trust necessary to work together for the safety of all," said rabbi David Niederman, president of the influential United Jewish Organizations of Williamsburg. "It's a victory for religious freedom and a victory for public policy." City health officials believe the practice, called metzizah b'peh, is inherently dangerous. There have been 17 infants harmed by the practice since 2000, authorities say. In response, the city's Health Department quietly issued two cease-and-desist letter to suspected mohels last year, a City Hall administration official said. But city officials have long resisted an outright ban, fearing rabbis would respond by conducting the ceremony in secret. Still, not all rabbis believe the oral suction is a required component of the bris - and some use a straw to avoid direct contact. "I wouldn't consider ever doing it. I would never consider putting any baby at risk," said Dr. Jeffrey Mazlin, who doubles as conservative mohel. Ultra-Orthodox rabbis do not believe there is scientific evidence. They have also sued the city, arguing the written consent form violated their religious freedoms. As part of the deal, the case will be dropped after the city tells the court about the agreement, City Hall officials said. "It's good government. It's common sense," said political consultant Ezra Friedlander, an Orthodox Jew. "Forcing parents into signing a consent form was counterproductive. It alienated the community." Most rabbis never complied with the consent form decree. As for the new deal, many issues remain unsettled, including the type of testing suspected mohels will undergo. The agreement has not been put to paper either and a potential ban will only be enforceable via fine. Still, city officials believe the accord is a breakthrough, arguing rabbis will now self-police. The issue has been a political third rail for de Blasio, who vowed on Day 1 to create a "new policy...that is fair." "It's clearly a balancing act," said political consultant Bob Liff. "The critical fact is there are babies dying. The question is how does the city deal with this? Bloomberg was much more insisted on trying to end the practice but they didn't feel they could because of the religious underpinnings." As for the tougher regulations, Liff added, "How do you enforce that? You are not going to send health inspectors to every bris. This is really a tough one."